Lucille and Desi, along with the writers from the radio show and producer Jess Oppenheimer, dreamed up a series for them and put together the pilot episode from parts of their vaudeville routines. The pilot was a staggering success and they found their sponsor in Philip Morris cigarettes. And things only got better, their daughter, Lucie Desiree Arnaz was born on July 17, 1951. Luckily they were able to achieve their unheard of wish of having the show shot on film, in Los Angeles, in front of an audience. For the parts of their neighbors, Fred and Ethel Mertz, they got established character actor William Frawley and stage actress Vivian Vance, whom Desi and Jess Oppenheimer had seen in The Voice of the Turtle. She and Lucille actually did become good friends. They were like sisters, they fought, but always loved each other. And as for William Frawley, Lucille said he, "WAS Fred Mertz!" She explained, "the writers took Bill Frawley verbatim" in creating that character. Once everything was set they went into rehearsals and filming commenced. 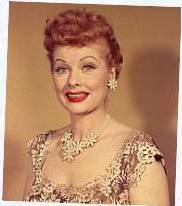 On October 15, 1951 at 9pm, I Love Lucy premiered. It was an immediate success. A television legacy was born and Lucy and Desi had found their way to work together. The public couldn't have been more pleased. Their love for each other in real life came across beautifully on the screen. Then in 1952, more wonderful news for the Arnazes - Lucy was pregnant again. While they were ecstatic, they feared it might mean the end of the show. They talked it over with Oppenheimer, the producer and thought, how about having Lucy Ricardo have a baby on the show? With their producer's encouragement, they got clearance for the idea from the network and the sponsors. 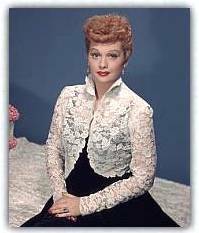 Lucille Ball's baby was going to be delivered by a planned cesarean section on January 19, 1953. Since it was a Monday, Lucy Ricardo would give birth the same day! Rapidly they went into production of the second season to give Lucille time to rest before giving birth. On the morning of January 19th Desiderio Alberto Arnaz IV was born and that night Lucy Ricardo also gave birth to little Ricky in the episode entitled "Lucy Goes to the Hospital". It knocked Eisenhower's inauguration off the front pages, and for years held the record for being the highest rated episode of a TV show. During the summer hiatus that year Lucy and Desi also made a movie together back at MGM. It was called The Long, Long Trailer and was a huge success. Everything seemed to be going great for the Arnazes, until one September night when columnist Walter Winchell got on the air and declared Lucille Ball a communist.